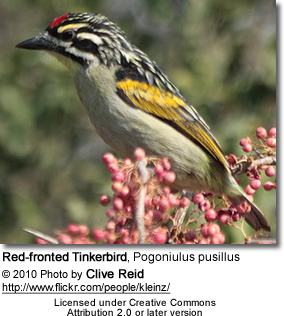 The Tinkerbird is the Pogoniulus genus wasformerly known as Tinker Barbet. Tinkerbirds are widely distributed in tropical Africa. 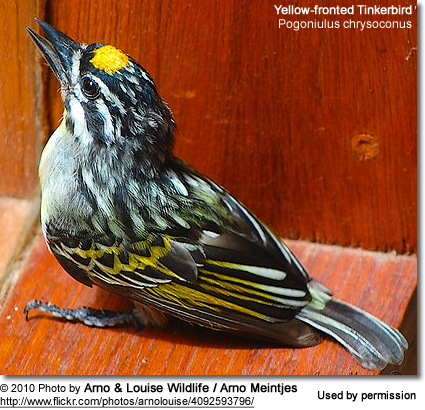 Tinkerbirds are smaller than other Africcan Barbets. They are plump-looking with large heads. Their heavy bill is fringed with bristles. These mostly solitary birds eat a variety of fruit, including figs. They may also visit plantations and feed on cultivated fruit and vegetables. Fruit is eaten whole and indigestible material such as seed pits regurgitated later. They are believed to be important agents in seed dispersal. In addition to fruits, they may take smaller insects, such as ants, cicadas, dragonflies, crickets, locusts, beetles, moths and mantids. They usually nest in holes bored into dead trees, branches or stumps. The hen usually lays between 2 to 4 eggs that are incubated for 13–15 days. Nesting duties are shared by both parents. Tinkerbirds may place sticky mistletoe seeds around the entrances of their nests, probably to deter predators.